If you ever wanted to get you rear-end to Mars, then Bohemia has the game for you. The latest in their Take On series, Take On Mars will put you behind the wheel of a Rover, exploring the surface of the unforgiving red planet. Take On Mars will feature three gameplay modes. Space Program will see you working for a science-driven Space Agency, looking to develop new technology, vehicles and instruments for their Mars exploration missions. Scenarios will offer up individual one-off missions with various objectives set on Mars’ dust bowls. Editor mode will enable you to develop your own goals and objectives. Take On Mars will not feature tentacled aliens larger than a bear, nor glittering tripods taller than a steeple, but it will have dynamic destruction, meaning your rover or observation robot will break if you don’t take care of it, and create absolute havoc for your mission. This will affect your budget, which you only have so much of, so plan your economy wisely. Realistic terrain, mapped from actual satellite data, means you’ll actually be exploring the real Mars. Just on your computer, not in space. 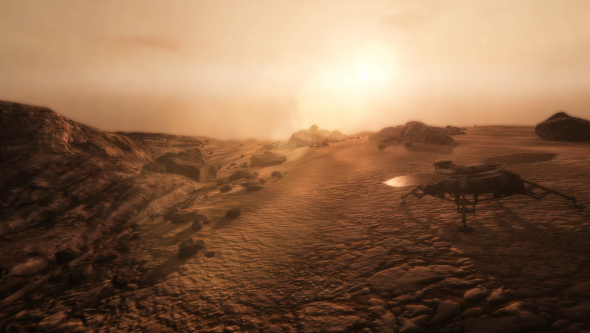 As Take On Mars is a Bohemia title, expect bucks loads of modability. Every last little piece of the game is modifiable. Whether or not that means we can mod-in the entire set of Total Recall remains to be seen. Take On Mars is due later this year. You can follow its progress on the Take On Mars website.